The following articles were written by Jeff Lester and published in The Coalfield Progress in Norton, VA; The Post in Big Stone Gap, VA; and The Dickenson Star in Clintwood, VA. Reprinted here with permission of The Norton Press Inc.
Last week, America lost another patriot who took up arms for love of his country. The most disturbing part is that he wasn’t battling the Taliban or al-Qaeda terrorists in Afghanistan. He wasn’t guarding the border between North and South Korea. He wasn’t flying a security patrol over northern Iraq or helping train government troops in the Philippines. I fear that Chip Collins was killed by a battle he fought almost 32 years ago. I flipped through a newspaper Thursday morning and stopped cold on the obituary page. A familiar name was there. A life, summed up across a few lines of black ink. The obituary went on to say he was a social worker, a patient rights advocate and a legal aid volunteer. And a Vietnam veteran who served at a place called Fire Support Base Ripcord. He was the oldest of eight children, the obituary noted. He is survived by two daughters and a best friend. His passing was marked by a visitation and a funeral all in the same day. I fear that this callous, hurried world will forget him all too quickly. After all, the world ignored the black nightmare of his personal Vietnam war while he was fighting it. We scorned young men like him at the exact moment when they realized they had actually made it home alive. That’s what heroes do in battle. When gunpowder smoke takes away their sight, when the roar of explosions and the screams of the dying fill their ears, they swallow their fear. They stand up and do their jobs. It’s a well-made true story about the first American soldiers who rode into battle on helicopters, in the Vietnam of 1965. These kids were proud, idealistic and hopeful that they would push back the North Vietnamese Army and the Viet Cong within months, maybe a year, then come home triumphant. In other words, Chip and his comrades-in-arms were still trying to win on the battlefield, just a couple of months after National Guard troops shot four Kent State University students during a May 1970 antiwar protest that turned into a riot. The students were demonstrating against the surprise invasion of Cambodia. That military action, and the massive show of outrage against it back home, dominated the international news for weeks and helped Richard Nixon decide to speed up his gradual pullout of American troops. I’ve studied the war enough that I immediately realized this book filled a giant gap in history. It detailed a battle far more devastating than the Cambodia invasion, but forgotten by history because it took place at the same time. The 101st Airborne Division — the same legendary outfit that’s now rooting out al-Qaeda stragglers in the Afghan mountains — was trying to wipe out a North Vietnamese stronghold hidden among bunkers and mountainsides near South Vietnam’s borders with the north and with Laos. The Screaming Eagles began their fight to retake an old Marine firebase, and Chip began his personal Vietnam war, on April Fool’s Day, 1970. American forces ended up in a four-month death struggle to hang onto the bald plateau named Ripcord against the onslaught of a much larger enemy force. They finally had to abandon it, at a cost of 114 dead and nearly 700 wounded. In 1983 Chip helped found the Fire Support Base Ripcord Association and edited its newsletter, The Ripcord Report. By the time I met him in September 2000, he was preparing to attend a 30th anniversary reunion that could attract 200 veterans. I talked with him for about three hours while Preston Gannaway captured him in photos. It was the kind of conversation that compels me to do this job — between someone with an extraordinary story to tell, and someone uniquely prepared to hear it. Chip was honest. He had come back to the World, tried to get back into the groove, failed as often as he succeeded. He had hurt people he loved. Thirty years later, he couldn’t stand in an open field, exposed, without remembering the sensation of being watched by snipers. He reached out to other Ripcord survivors who he rightly figured might be haunted like him. He wanted to get local publicity for Nolan’s book in hopes of finding other Southwest Virginia guys nearby who wanted to talk through their experiences. “I always knew that getting the facts out, talking about it, is the key to getting better,” he told us. Chip and I communicated by e-mail for a few more weeks, then we lost track. The next time I heard from him was April Fool’s Day, 2002. Chip copied me on a series of e-mails among Ripcord survivors about the film industry’s sudden interest in a movie version of Nolan’s book. I meant to e-mail him back and thank him for getting me into the mix. I didn’t do it in time. I started writing for newspapers about 12 years ago, and that’s when I started reading the obituaries faithfully. What jumped out at me, week after week, year after year, was the number of men ranging from their early 40s to mid-50s, dying too young in our neighborhoods. As I read down into the notices, sure enough, I saw it again and again — Vietnam. A few of them make the choice to depart from us. Many fight a losing battle with ailments born from a walk through a jungle leveled by Agent Orange. Many are betrayed by the failure of battle-scarred bodies and memory-scarred hearts. All too often, we failed them. By the time we finally listened, they almost couldn’t bear to tell anymore. If you know a Vietnam veteran, go thank him or her. Make sure they know how you feel. Don’t wait. 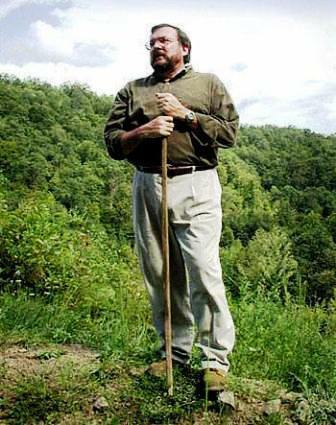 THIS STORY WAS PUBLISHED IN SEPTEMBER 2000 IN THE COALFIELD PROGRESS, A TWICE-WEEKLY NEWSPAPER IN NORTON, VA., AND IN ITS WEEKLY SISTER PAPERS, THE POST IN BIG STONE GAP, VA. AND THE DICKENSON STAR IN CLINTWOOD, VA.
REPRINTED BY PERMISSION OF NORTON PRESS INC.
Chip Collins stood atop a wooded ridgeline near Birchleaf, staring across the gap where two other peaks meet and rise halfway up the sky. The steep green hills near his home look much like the lush jungled mountains of Vietnam he hiked for nearly a year three decades ago. Collins has been quietly searching these hills for others who survived a decisive but largely unknown 1970 battle at a remote artillery support base called Ripcord. He also wants to find men who fought other bitter struggles in the same northwest corner of South Vietnam at a time when most Americans were split between ignoring or protesting the war. The 49-year-old Wise native is a founder of the Fire Support Base Ripcord Association and the first editor of its newsletter, the Ripcord Report. The group’s 30th anniversary reunion is expected to attract as many as 150 Ripcord survivors and others to Louisiana this October. Collins is convinced more guys are out there in the Southwest Virginia hills, wrestling alone with their memories, not knowing the association exists. Others may not have fought at Ripcord but fought close by. So many mountain boys were valued for their skill in the bush, odds are more than a few live not far from him, Collins figures. Some might have known only that they were on or near a big bald hill pounded by the North Vietnamese Army for nearly three weeks, without ever knowing its name. Collins is reaching out to them now, offering the same brotherhood that has helped him get through hard times since he began his search 17 years ago. With a Clinch Valley College degree in social work, Collins is a pro at reaching out. He’s also a rare veteran who’s willing and able to discuss his experiences freely. Some of them are stones on a rough path — lingering psychological battle scars, divorce, trouble keeping a job. Collins welcomed visitors to the small mobile home he rents south of Haysi, where he settled a few years ago. He likes Dickenson County, he said, “because the people over here are such survivors,” fighting to keep a cash-poor, job-starved community alive. He brought out photos and printed stories from the battle for Ripcord, along with carefully preserved copies of the Ripcord Report and pictures from past reunions. Collins was 19 and green when he trudged into the heart of an enemy stronghold and began to draw all sorts of fire, from rifle bullets to massive artillery shells that rained on the firebase for weeks. Fortunately, he learned from tough, experienced troopers how to survive — stay off trails, keep your head down and hidden, make the bush your shelter, become silent and invisible. “You can’t imagine going a whole year without making a sound, except in the rear,” he said. Three decades later, the habits of a single year in combat still tug at him. Collins suffers from a particular form of post-traumatic stress disorder — fear of open spaces, of not having a hiding place. After college, Collins worked in child welfare for 10 years at the Norton social services office, then spent nine years as a patient rights advocate at Marion’s Southwestern State mental hospital. He left in 1996, needing a change. But the economy and his need to wander made Collins bounce from job to job. He worked at factories in Tennessee and Kentucky, mined coal, finally ended up back in social work at an independent living center, but parted company with it, too. Now Collins works for a Lebanon agency that helps the disabled find and train for jobs, especially in Dickenson, Buchanan and Tazewell counties. The PTSD brings on episodes that have interfered with his ability to work at times, he acknowledged, adding that he’s gotten counseling that helps — sometimes. Family isn’t necessarily a source of support. Collins’ daughters, who don’t live with him, also don’t want to hear about the war. One, 21, is against war and guns, and the other, 15, hasn’t shown any interest. Collins is able to talk to one other Dickenson County veteran of special forces, who fought in the same areas seven years earlier. He found a veteran from the same time and place in the war as him, living in Vansant, and hoped for a frequent local contact to share stories. But a visit to Vansant ended that. The man’s mental state is too far gone, Collins said sadly. Around 1983, Collins began seeking out survivors of the terrible battle for Ripcord. By 1986, he and others had located hundreds of troopers and he was editing the Report. Collins geared the Report for brotherhood, for forging emotional bonds. Comrade Chuck Hawkins took over editing it later and has leaned more toward the military details, but has done a good job of leading the group, he said. The first reunion in 1986 drew maybe 16 or 19 guys, Collins said. The last one, in 1999, may have attracted 50. This year’s event is special, he said. Along with being the 30th anniversary, this is the year when major Vietnam military writer Keith Nolan produced the first book to describe the Ripcord incident in detail. The Ripcord Report, and retold stories from Collins and other survivors, form the heart of Nolan’s book. Collins sees it simply as a beginning to putting this largely ignored piece of history in its rightful position of importance. The association should take the lead, he believes. “I always knew that getting the facts out, talking about it, is the key to getting better,” he said. THIS STORY ALSO PUBLISHED IN SEPTEMBER 2000, AS A COMPANION PIECE TO THE STORY ABOUT THE RIPCORD ASSOCIATION. Rodger “Chip” Collins is a witness to hidden history. As a 19-year-old Army private first class, Collins fought at the heart of America’s last major battle in Vietnam. His unit — 2nd Battalion, 506th Infantry of the 101st Airborne Division (Airmobile), gave up 40 of the 77 soldiers killed during the siege of Fire Support Base Ripcord, a mountaintop artillery position deep in North Vietnamese Army territory, from July 2-23, 1970. When you add the battles required to take the hill and establish the firebase, beginning in mid-March, the cost of controlling and eventually giving up Ripcord becomes 114 dead and nearly 700 wounded. But almost no one knows about what happened at Ripcord — except for the survivors, a few others who fought nearby and a handful of military historians. By the time the battle began, American troops could see the end of their Vietnam war in sight, and most American civilians were more than ready to forget Vietnam even existed. For 30 years, almost no literature existed about the 101st’s significant role in 1970, as America’s war petered out. Now this gaping hole is about to get filled. With the help of veterans like Collins — who founded the Ripcord Association to maintain links between survivors — author Keith William Nolan has completed a book detailing the battle and its previously ignored importance. “Ripcord: Screaming Eagles Under Siege, Vietnam 1970” was published in July by Presidio Press Inc. Among the most important sources influencing Nolan’s decision to write, and filling in the story’s details, was the “Ripcord Report,” the association newsletter founded by Collins and continued by former 101st company commander Chuck Hawkins. Firebase Ripcord was a bald lump of dirt on a mountain jutting up in the middle of Thua Thien Province, near South Vietnam’s extreme northwest corner. I Corps, the military region including Thua Thien, was best known to the American public for three events. One was the vicious battle for the provincial capital, the city of Hue, during the enemy’s 1968 Tet Offensive. Another, only a few weeks later, was the bitter months-long siege of a Marine base at Khe Sanh. The third took place 10 miles south of Ripcord in May 1969 and made international headlines. It was a bloody battle for a mountain in the A Shau Valley called Dong Ap Bia, not far from the Laotian border. For nine days, the 101st, nicknamed the Screaming Eagles, tried to root North Vietnamese Army forces out of mountaintop strongholds before finally taking control, at the cost of 56 killed and more than 400 wounded. Dong Ap Bia became known to the troopers and the American public as Hamburger Hill. The fact that it was abandoned almost immediately after being taken at such a terrible price came to symbolize the war’s seeming futility. Two months later, President Richard Nixon ordered the start of “Vietnamization,” his policy of gradually pulling out U.S. forces and turning the war over to their South Vietnamese allies. Only two events from the war in 1970 stick in the minds of most Americans — the April-May invasion of Cambodia, and the fatal shooting of four Kent State University students when an anti-invasion protest became a riot. At the same time, the 101st was working its way back toward the A Shau to pound the NVA one last time before handing responsibility to the South Vietnamese. But the division faced one key difference from a year before. Hamburger Hill had sapped the commanders’ willingness to suffer terrible casualties and to do whatever it took to master the valley, which the NVA now owned completely. Trying to fight the enemy in his back yard but avoid casualties was contradictory. It backfired. Chip Collins had barely arrived in Vietnam in March 1970 when the 2/506th was sent to help prepare Ripcord. They walked into the fire right away, getting nailed to the hillside under mortar attack on April Fool’s Day, as Collins chronicled in a 1986 Ripcord Report. The Currahees and other 101st units eventually carved out bunkers, artillery positions and communications complexes on the mountain. Ripcord would provide the big guns to support a push south into the A Shau as part of Operation Texas Star, the last mostly American offensive of the war. Or would it? Collins notes there’s evidence in the Texas Star operational plan that the brass may have never intended to go back to the A Shau’s death trap. Instead, they would set up an exposed firebase to draw the NVA like honey on an anthill. Collins was among roughly 300 troopers who would alternate between providing security on Ripcord and venturing to look for the enemy among neighboring hills and valleys. Meanwhile, the push to the A Shau never happened. Beginning July 2, the Screaming Eagles were too busy trying to stop a nearly constant rain of NVA mortars and artillery shells smashing Ripcord. The hilltop bristled with firepower and was ringed with an elaborate wall of wire — razor wire, concertina wire, barbed wire. Commanders were certain this intricate maze would hold off full-scale NVA infantry assaults and infiltration attacks, Collins said. After days and days of relentless bombing, the troops were exhausted. “I know the NVA could come through the wire if they wanted to,” he said. The 101st also needed to secure two prominent nearby peaks the enemy controlled, Hill 805 and Hill 1000. But Collins had to help haul dead and wounded off 1000 after several failed attempts. And commanders put some troops atop 805, but not enough to hold it. Collins witnessed from Ripcord as the NVA mauled an undermanned unit on 805 for days because Brig. Gen. Sidney Berry was unwilling to risk more deaths and woundings to send reinforcements. “I watched every night as a company got reduced to a platoon,” he said. Collins also was among those who witnessed on the 18th day of the siege as the NVA shot down a giant Chinook supply helicopter. It crashed into an ammunition dump that blew up with such force it tore the top off much of the hill. Ultimately, Ripcord was surrounded by NVA anti-aircraft artillery and mortar positions that could fire on it virtually at will, Collins said. Down below were hillsides and valleys that hid endless enemy bunkers, which Collins only recently learned were all interconnected. On July 21, one of Hawkins’ riflemen shot a young NVA courier and found on him a map outlining plans for a massive ground attack on Ripcord. Two days later, the commanders decided holding the hill wasn’t worth the cost. A seemingly endless relay of helicopters lifted the Eagles to safety a half-dozen at a time. When everyone was gone, fighter jets and bombers smashed the abandoned firebase back to an anonymous pile of dust. Collins later fought with a reconnaisance squad, unwilling to waste away the last months of his tour with undisciplined troops in the safer rear areas. He left in February 1971, but not before watching the buildup of South Vietnamese troops assisted by 101st helicopters, preparing for the ill-fated Lam Son 719 assault on NVA hideouts in Laos. The South Vietnamese got their tails kicked badly, hinting at the failures that would let North Vietnamese tanks roll into Saigon four years later. I am not a veteran, but I very much consider myself a child of Vietnam. I was 7 when the first Marines hit the beach at Danang, and I was 17 by the time Saigon fell. My first personal encounter with the war came when my first cousin, who became a minor league pitcher straight out of high school, was drafted. He served on a helicopter crew that would go in and retrieve whatever could be removed from crash sites of other helicopters. I’ve tried to get him to talk about his memories, but he won’t. I developed a lifelong, amateur historian’s interest in war, the reasons for wars and their lingering effects on the people who fought. I became a journalist in 1990. Four years later, I put together a package of stories to commemorate the anniversaries of D-Day and the Battle of the Bulge (interviews with surviving vets). I realized that I was deeply motivated to tell the untold stories of the silent heroes who walk down our streets here in Southwest Virginia every day, carrying their memories with grace and dignity. Since then, I’ve put together a package of veterans’ stories in time for Veteran’s Day and Memorial Day each year. One of the great highlights of this work was being invited to attend and cover a reunion of Vietnam vets from Pound, Va. in 2000, including interviews with a medic who served along the Ho Chi Minh Trail, a helicopter pilot and an infantryman who won the Silver Star for stopping an ambush while patrolling one of the Michelin rubber plantations. Another highlight was being invited to cover the funeral at Arlington of another man from Pound, a fighter pilot who went MIA over Laos and whose remains were finally recovered in 2002 in a Laotian village just a few miles northwest of the Ashau Valley. Over the years, I’ve become known as the de facto military reporter among our three papers. Needless to say, it’s been a busy three years as I’ve interviewed guys from the 101st who served in Afghanistan, a guy from the 3rd Infantry Division who rolled into Baghdad last year, numerous local National Guard troops who deployed in support of the Iraq war, and more. In short, I do this to remind people that their seemingly ordinary neighbors and acquaintances are on the other side of the world, facing grave danger every day so they don’t have to. And that when those neighbors and acquaintances finally finish their tours of duty, they will be carrying a terrible burden of combat memories back into civilian life. They need to be embraced, thanked, and welcomed home. No one understands the importance of that better than a Vietnam vet.